Saint Mary’s boys’ basketball team traveled the short distance across the Red to face Lakeview last week in non-district action. The talented Lakeview team would prove to be a formidable foe. The Tigers won the tip but couldn’t get points and settled into a 1:3:1 defense in the back court. Tony Arnold is the lone man responsible for guarding #5. The Gators miss a couple of early easy layups and the score was tied at 2 a piece with 6:02 showing on the clock. Parker Bankston hit a three and Tigers go up 5 – 3 and Bankston has all the Tiger points. Lakeview went full court pressure against the Tigers. SMH handled the pressure well and Tigers go up 11 – 6 over the Gators. The lead would be short lived as the Gators sink threes to tie it up at 11 with 2:15 to go in the first. Lakeview went up 15 – 11 after one period of play. The Lakeview Gators went to their bench and had a deep one from which to pull. The fresh legs from the bench allow the Gators to extend their lead to 10 as the Tigers go cold and commit some errors. The Tigers stick around though and keep it close at 10 points through most of the second. With 3:37 showing on the clock, the Tigers went to the line for a 1:1 as they are the bonus. The lead remained 10 for the Gators 28 – 18. With under 40 clicks on the clock, Bankston missed a three and the Gators go to the line on the rebound down court. The lead is still 10 at the half, 33 – 23. Saint Mary’s enters the third with the ball and faced continued full court pressure. Missed shots by the Gators allow Tigers to stay close. Bankston was hitting his shots and Paul Messenger nailed a three to get it to within four, 36 – 32. Back to back 3’s by the Gators got the lead back to 10 for Lakeview. That lead extended to 14 on the shooting of the Gators, 48 – 34. Saint Mary’s is back to within nine with :48 on the third quarter clock when Bankston hit a clutch 3 to make it a six-point game 50 – 44. A short-range lane jumper by the Gators makes it eight points. Thomas Howell answers with a bank shot off the glass to end the third and get the score to a six-point deficit, 52 – 46 to start the fourth. Lakeview three-point shooting hurt the Tigers. Saint Mary’s was still hanging in there trailing by 10. 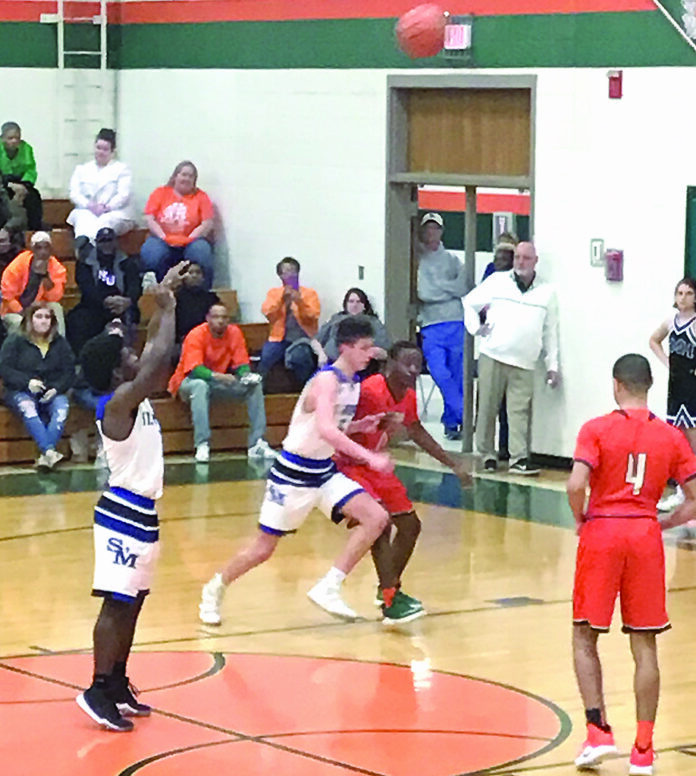 Lakeview seemed to be hitting greater than 60 percent of their three point attempts and stretched the lead to 16 points, 68 -52, with half of the fourth quarter clock expired. Fast break scoring makes things even worse for the Tigers. They trail 72 – 55. Howell showed his range and hit back to back three-point shots and the Tigers were back to within nine, 72 – 63, on the eight to zero run. The Gators answered and went on a 4:0 run making it 76 – 63 with 1:37 to go. The Tigers elected to foul and put the Gators at the line to get a chance to get back in this one. Lakeview is solid at the line and went to four corner time draining offense with the lead. Tigers fell 78 – 65 in this one, but they fought hard and hope to use the loss to springboard into the end of district play. © 2019 The Natchitoches Times, Inc. All rights reserved.